Hey guys! 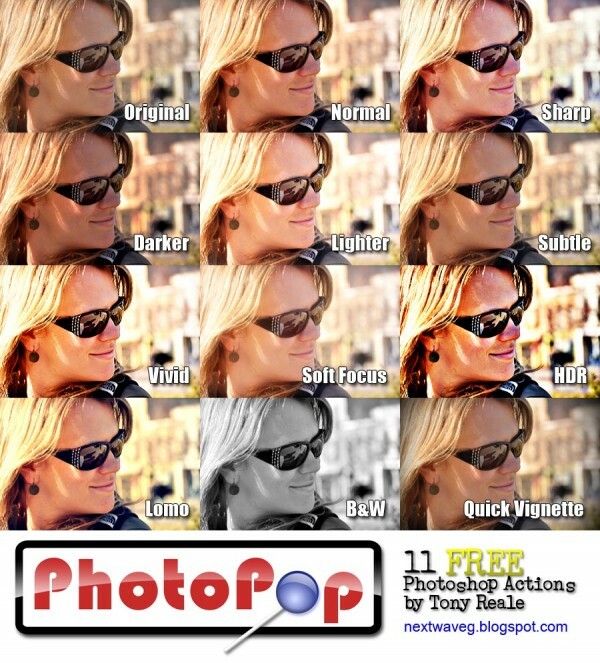 I’m excited to announce the release of PhotoPop, a collection of 11 Photoshop Actions designed by yours truly. Best of all they’re FREE! I created these actions to be a companion for any photographer. Most other action packages I found were too bold and ended up either blowing out or darkening the image too much. PhotoPop is designed to add small effects to help your photos “pop” without changing the style of your original shot. They are so flexible that you can use more than one at a time for added effect. There are also bolder actions for when you want a different artistic look. Normal – This is the default action for use with most photos. Sharp – The same pop, but with a sharper look. Darker – If your image is too light and is getting washed out by Normal, try Darker. Lighter – If your image is too dark and is getting crushed by Normal, try Lighter. Subtle – If Normal is still too bold, try Subtle. Vivid – PhotoPop cranked up a couple notches. Soft Focus – PhotoPop with a soft focus. HDR – PhotoPop using a HDR look. Lomo – PhotoPop using a lomography look. B&W – Black & white with a little pop. Quick Vignette – Most photographers like to add a subtle vignette to these effects, so I included an quick, easy action. I hope you enjoy! Feel free to comment and let me know how they worked for you. Send over any pictures and I’ll post them on the blog. For more examples of PhotoPop in use, visit our Facebook page. These actions were designed in Photoshop CS4 and have been tested in CS3. I don’t know if they work in any other versions. Test them out and let me know. [UPDATE] Special thanks to IrishTom for testing them in CS2 and Photoshop 7 and letting us know that they work. To use PhotoPop, unzip the file into: Photoshop > Presets > Actions. Then load Photoshop and open your Actions panel: Window > Actions. Click on the drop down menu and select PhotoPop to load the actions. Then click on the desired action and press play at the bottom of the panel. Legal stuff: Feel free to download and use these for commercial use. Do not redistribute without my written consent. Thanks, will try these out today!